Doc Martens is a British footwear brand which was created more than fifty years ago and introduced a new and revolutionary kind of shoes. It is an icon of British culture even if it finds its roots in Germany and is well-known worldwide. The brand was named after Klaus Märtens, who was a doctor during the war. He broke his ankle when he was skiing in the Bavarian Alps. While recovering, he came up with the idea of a new kind of shoe. He actually gave army boots a new twist by adding soft leather and air-padded soles to them, which made them more comfortable. The boots did not have much success until he met up with an old friend. Doctor Herbert Fünck helped him to give a boost to his business and in 1947, Doc Märtens boots had already become a must have. At the beginning, 80% of their production was sold to German housewives over the age of forty, who were looking for something comfortable and sturdy. The growing success of the boots encouraged the two friends to extend their brand internationally. In 1960, British shoe manufacturer R. Griggs Groups Ltd. took great interest in the brand and decided to buy the patent rights and to give it an English name as well as a slightly new shape. That is how the Doc Martens shoes as we know them today were born and ended up being a British icon. The British sitcom ‘The Young Ones’ even dedicated a song to them. Back in the 1960’s, the market target was quite broad since the product attracted different kinds of people, from postmen to police agents, in short, people for whom wearing comfortable shoes was a priority. Associations with different groups contributed to lower the brand’s popularity, as in the 1970’s with the skinheads or to give it a trendy image, when it became Punks’ favorite accessory. Nowadays, the brand provides a wide range of different models, while remaining faithful to Doc Martens’ original bestseller. Men, women, children… there is something in it for everyone! As far as the price is concerned, a basic model costs about one hundred euro. However, any innovation causes the price to increase drastically. If you want to learn more about those fancy shoes, here is a youtube link to their story. 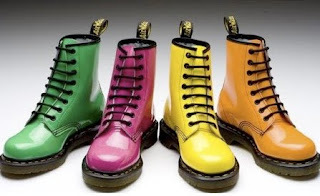 To conclude, Doc Martens boots have gone through a lot of changes to become one of the world’s most famous pair of shoes and are still pretty much fashionable. Jessica Alba, for example, has already been spotted wearing the famous shoes.